Posted February 25, 2010. Filed under Addons. Tags: IDE. Wing IDE is a commercial cross-platform Python IDE. This article describes how to configure Wing IDE to run Vizard scripts. Download and install Wing IDE from their downloads page. You can have Wing IDE execute scripts with Vizard by using the "Toolbox Command" feature. Go to Tools > OS Commands from the main menu. This will activate the OS Commands tab in the tool pane. Within the OS Commands pane go to Options > New Toolbox Command. This will pop up a dialog where you can enter the properties of the toolbox command. Select Command Line as the type and enter the path to winviz.exe in your Vizard bin directory followed by "%s" (i.e. "C:\Program Files\WorldViz\Vizard30\bin\winviz.exe" "%s"). You can also assign a name and keyboard shortcut to the new toolbox command. 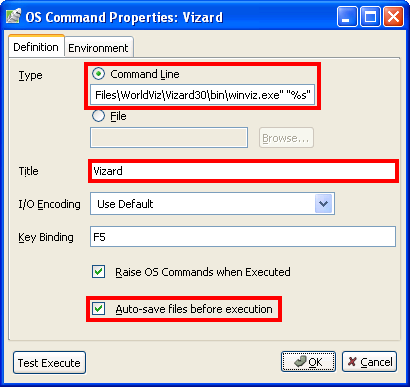 Now you can use the assigned keyboard shortcut or the OS Commands pane to run the active script with Vizard. In order to get Wing IDE to perform code completion on Vizard modules, you will need to tell it where the Vizard python directory is. Go to Project > Properties from the main menu. 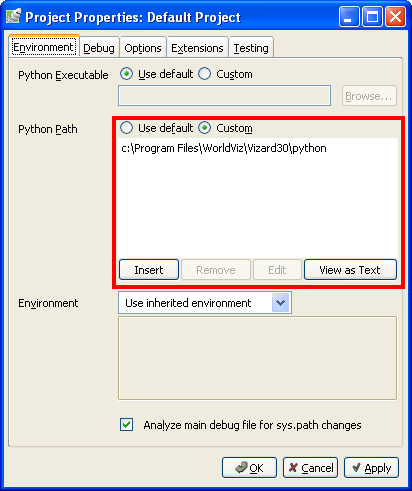 Within the properties dialog select Custom for the Python Path and add the Vizard python directory, as shown below.